The problem with the Geneva Communique from the first Geneva round on Syria is that the government of Syria never subscribed to it. It was jointly chaired by the League of Arab States for Syria, whatever that may mean. Another problem is that it is, as so many diplomatic documents are, highly ambiguous. It plainly advocates a power sharing executive formed by some of the current government plus the opposition to oversee a transition to democracy. But it does not state which elements of the current government, and it does not mention which elements of the opposition, nor does it make plain if President Assad himself is eligible to be part of, or to head, the power-sharing executive, and whether he is eligible to be a candidate in future democratic elections. Doubtless the British, for example, would argue that the term transition implies that he will go. The Russians will argue there is no such implication and the text does not exclude anybody from the process. Doubtless also diplomats on all sides were fully aware of these differing interpretations and the ambiguity is quite deliberate to enable an agreed text. I would say that the text tends much more to the “western” side, and that this reflects the apparently weak military position of the Assad regime at that time and the then extant threat of western military intervention. There has been a radical shift in those factors against the western side in the interim. Expect Russian interpretations now to get more hardline. Given the extreme ambiguity of the text, Iran has, as it frequently does, shot itself in the foot diplomatically by refusing to accept the communique as the basis of talks and thus getting excluded from Geneva. Iran should have accepted the communique, and then at Geneva issued its own interpretation of it. But that is a minor point. The farcical thing about the Geneva conference is that it is attempting to promote into power-sharing in Syria “opposition” members who have no democratic credentials and represent a scarcely significant portion of those actually fighting the Assad regime in Syria. What the West are trying to achieve is what the CIA and Mossad have now achieved in Egypt; replacing the head of the Mubarak regime while keeping all its power structures in place. The West don’t really want democracy in Syria, they just want a less pro-Russian leader of the power structures. The inability of the British left to understand the Middle East is pathetic. I recall arguing with commenters on this blog who supported the overthrow of the elected President of Egypt Morsi on the grounds that his overthrow was supporting secularism, judicial independence (missing the entirely obvious fact the Egyptian judiciary are almost all puppets of the military) and would lead to a left wing revolutionary outcome. Similarly the demonstrations against Erdogan in Istanbul, orchestrated by very similar pro-military forces to those now in charge in Egypt, were also hailed by commenters here. The word “secularist” seems to obviate all sins when it comes to the Middle East. There would be a good dossier to be issued on torture in detention in Qatar, and the lives of slave workers there, but that is another question. That is what any decent journalist would ask. Which is why you will never hear those questions on the BBC. As it is the weekend, you might be interested in the music choices of the Counterpunch staff. Something we may have missed….Bibi visits the troops..
On Tuesday, Netanyahu travelled to the occupied Golan Heights to visit IDF field hospitals set up to treat wounded anti-Syrian fighters, and offer words of encouragement before they were made ready to return to kill more Syrian soldiers and loyal civilians. Speaking from Istanbul, Badie thanked those working to assist the Syrian people in their struggle. On Tuesday, Netanyahu spoke at an IDF base where injured Syrians are receiving medical care. He said Israel’s humanitarian efforts to help the Syrian wounded highlighted the difference between Jerusalem and Tehran, which backed Assad. He said the “good” was embodied by Israel’s endeavors to save the lives of Syrians hurt in the ongoing conflict, which he termed a “daily massacre,” while Iran continued to support Assad’s violent ways. Well the appropriately named Badie was right in one respect – it is an important message that Israel is fully backing anyone and everyone ‘regardless of creed or ethnicity’, who will fight Syria. So anyone still trying to suggest that Israel doesn’t really have a position, and may even prefer Assad to stay, needs to think up another story. 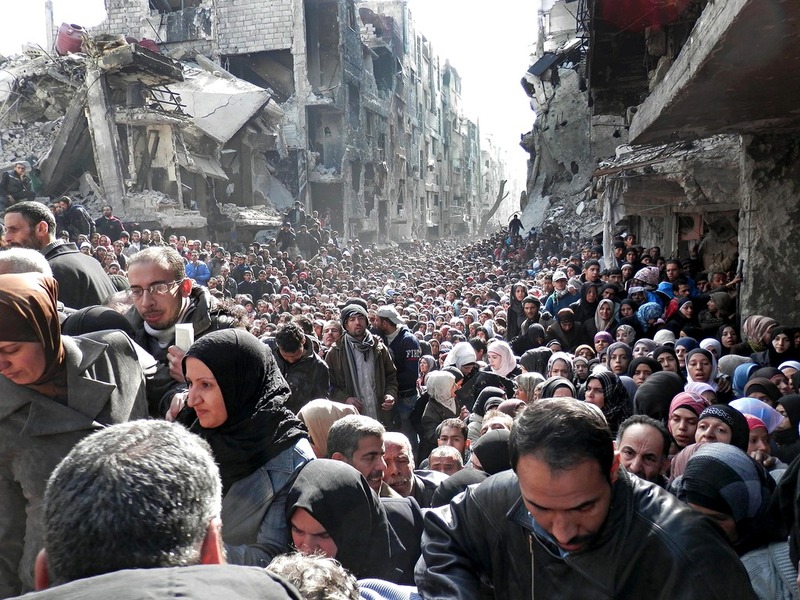 This is Yarmouk and the people are Palestinian. Terrible. sites that those who ‘believe’ it was a Syrian state force have suggested. For the first time in AIPAC HISTORY we are beginning to lose our iron clad weapon “Congress”.